Against an epic backdrop of one-sided sibling rivalry, rock-em sock-em lumberjack action, bizarro world medical pronouncements, ham-fisted Mahabharata references, unrequited puppy-love, puffy sleeves and big-budget musical excess lies a plot which I will mostly let speak for itself through screenshots, because all it left me with were questions. Questions like: Why is Vinod Khanna in this film? Why is Saeed Jaffrey in this film? Why is anybody in this film? Why does this film exist at all? How did the actors keep their faces straight through their dialogues? How old were the people who wrote this, anyway? Were they even out of grade school yet? And above all, will I ever make it all the way through?! 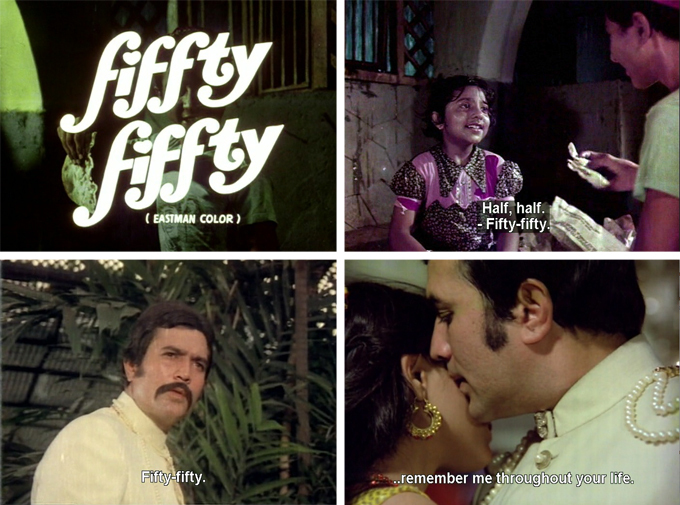 There are only two things which give me *good* nostalgia for the 70s: ABBA music and Hindi movies. I spent the latter half of that decade wearing hideously patterned Qiana shirts, sporting feathered hair and fighting the tendency of my stomach to overhang hip-hugger bellbottoms, all the while living in rural Indiana and wishing I were dead, so that is actually saying something. I suppose if I had cable television and thus access to reruns of the original “Starsky & Hutch” television shows that might do it too, but I don’t. I love Laxmikant Pyarelal’s music in this film, though, especially the opening title and background music (although the songs are fab too). It’s funkadelic 1970s, all the way, and reminds me of the opening themes to those 1970s cop shows.